The petticoat is derived from the jupe or underskirt of the eighteenth century. As the skirts of women's robes were open at the front, the jupe had to be as highly decorative as the robe, and was often constructed of the same rich material. Around 1715 the petticoat became an undergarment that gave structure to the outer skirt by means of a series of whalebone hoops. By the nineteenth century, petticoats had several functions. They were used as underlinen to provide warmth and protect outer clothing from an unclean body, to give a structure to the skirt depending on the fashionable silhouette of the time, and to disguise the shape of the legs to give a modest appearance to a woman. It formed part of an extensive range of underwear as worn by the Victorian woman, which was comprised of a chemise, drawers, corset, and several petticoats. Petticoats were generally in two forms until the end of the nineteenth century: a petticoat with a bodice attached or a separate waisted garment which was corded, that is, it had tucks with cords threaded through and drawn in to the waist to provide initial support for the crinoline skirt. Made out of cotton, linen, cambric, and flannel for winter, several petticoats would be worn at once in the 1840s to provide a bell-shaped structure for the skirt and were stiffened with horsehair at the hem. With the invention of the cage crinoline, petticoats became less structural, and usually only one was worn under the crinoline cage for warmth and modesty as the cage had a habit of flying up when a wearer sat down too rapidly. 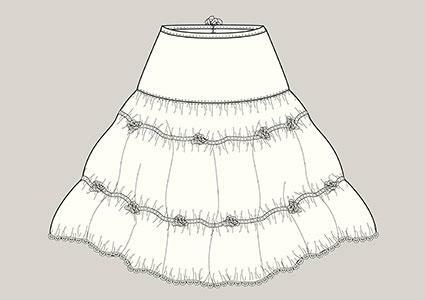 Another petticoat was customarily worn over the crinoline to soften the steel rings of its outline and tended to have an ornately decorative hem, usually of broderie anglaise or crochet as it was likely to be exposed when the wearer was walking. The shape of the petticoat was very much determined by the fashionable shape of outerwear and thus changed over the century from the narrower shapes of the 1860s to the gored cuts of the 1870s and the overly frilled and flounced froufrou of the Edwardian Era. The slimmer cut of 1920s fashions and bias cut of the 1930s necessitated a different kind of underwear-usually French knickers and bias-cut slips derived from the petticoat and attached bodice of the nineteenth century. In 1947 Christian Dior's Corolle Line, later dubbed the New Look, heralded the revival of the bouffant skirt, a round crinoline shape with an understructure comprised of several petticoats. The look was incorporated into teenage culture in the 1950s as young women adopted the petticoat and wore several at once-usually of sugar-starched net and paper nylon, or (for evening) taffeta, at least one of which was stiffened with plastic hoops. The look was particularly associated with rock 'n' roll and jiving as the petticoats preserved the dancer's modesty when exhibiting twirls with her male partner. In the 1960s the petticoat disappeared in daywear and, in much the same way as the corset, became the preserve of fetishism. The allure of the petticoat can be explained by the way it exaggerates certain characteristics of the female body, by emphasizing the hips it highlights a fragile waist. It has thus earned a place in fetish culture as a signifier of femininity, and magazines such as Petticoat Discipline allude to the popular cross-dressing scenario of a little boy being forced to parade in front of his family and friends in petticoats as a punishment for some misdemeanor. The frisson of pleasure achieved through shame thus creates a fetishist. British designer Vivienne Westwood revived the petticoat in the late 1970s and 1980s as a result of theatrical New Romantic dressing and the experiments with the mini-crini. The wedding of Lady Diana Spencer to Prince Charles in 1981 heralded a revival of the nineteenth-century silhouette in bridal design as a result of her crinoline-skirted wedding gown designed by David and Elizabeth Emmanuel. Thus, the contemporary petticoat is often used as an understructure in women's formal wear, in particular bridal gowns and in outfits worn by female country and western singers; Wynona Judd is associated with this look. See also Crinoline; Corset; Petticoat; Underwear. Carter, Alison. Underwear: The Fashion History. London: Batsford, 1992. Cunnington, C. Willet and Phillis. The History of Underclothes. London: Dover Publications, 1992. Saint-Laurent, Cecil. History of Women's Underwear. London: Academy Editions, 1986.